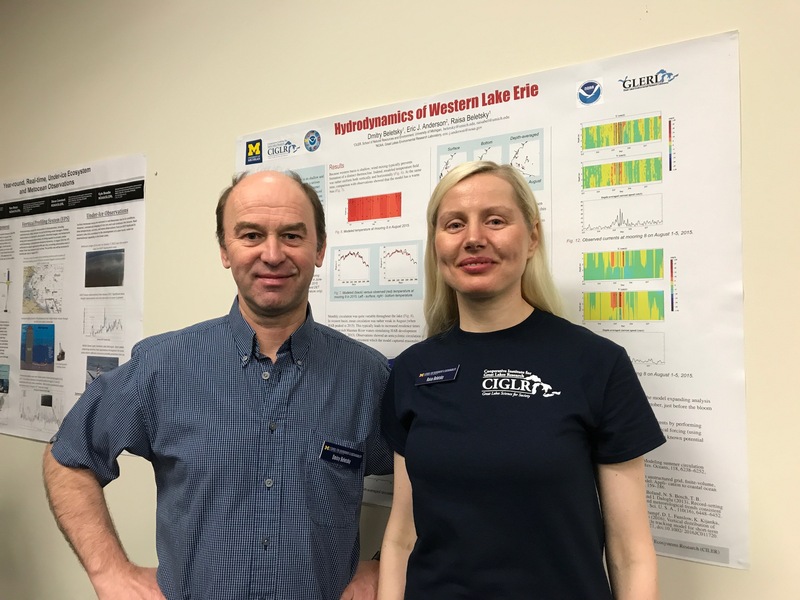 CIGLR Research Scientist Dima Beletsky and Research Assistant Raisa Beletsky presenting their poster titled: Hydrodynamics of Western Lake Erie. Photo Credit: Michele Wensman. The Lake Champlain Project team. 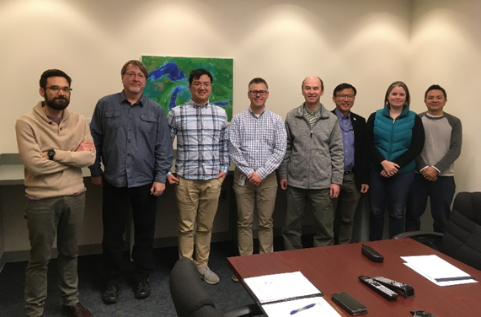 Pictured from left to right: Dr. Eric Anderson (NOAA GLERL), Timothy Hunter (NOAA GLERL), Dr. Chuliang (Andy) Xiao (CIGLR), Dr. Jesse Feyen (NOAA GLERL), Dr. Dmitry Beletsky (CIGLR), Dr. Philip Chu (NOAA GLERL), Lacey Mason (NOAA GLERL), and Haoguo Hu (CIGLR). Photo Credit: El Lower. 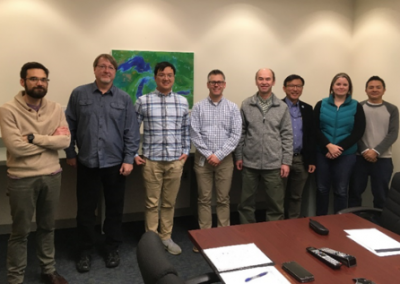 CIGLR research scientists (L-R Songzhi Liu, Dima Beletsky, Huayun Zhou, Raisa Beletsky and Andy Xiao) and staff celebrate as CILER was awarded NOAA’s next Cooperative Institute in the Great Lakes and the new Cooperative Institute for Great Lakes Research (CIGLR) took its place! 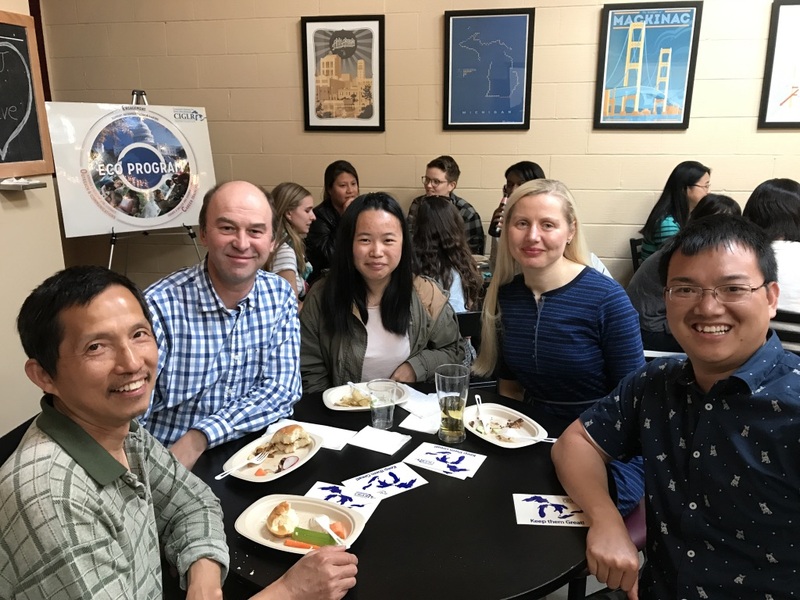 A large group of CIGLR’s staff and partners came to Wolverine Brewery in downtown Ann Arbor, MI to celebrate! Photo Credit: Michele Wensman. 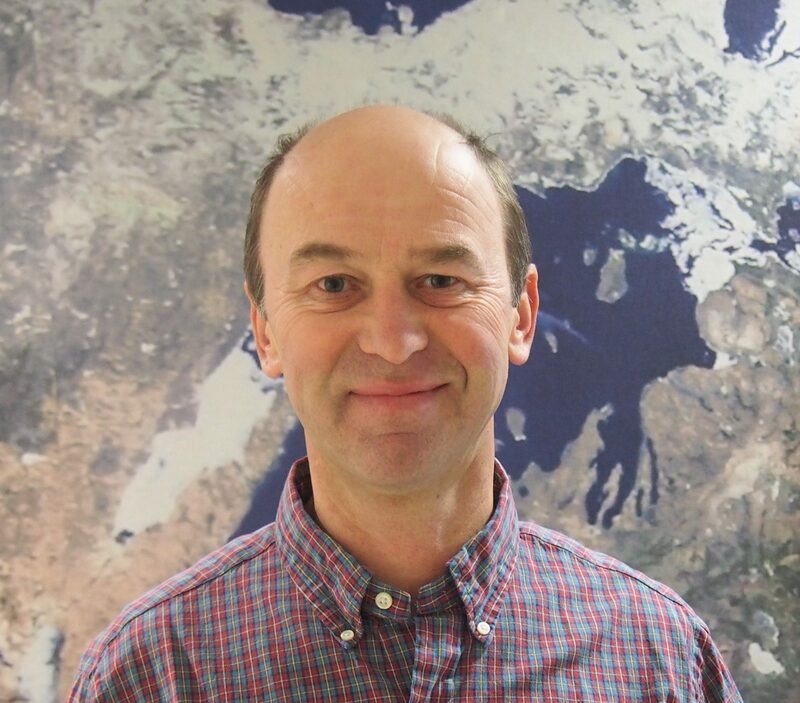 Dr. Beletsky has been with the SEAS Cooperative Institute for Great Lakes Research (joint Institute between University of Michigan and NOAA) since 1995. His research expertise lies in the hydrodynamics of lakes and coupling lake physics with biological processes. 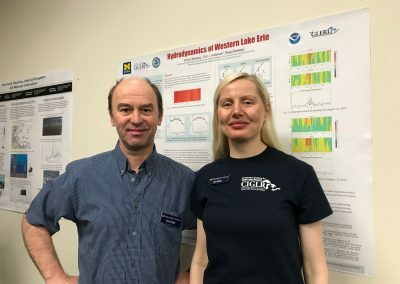 Since the beginning of his career in limnology in Russia, he has worked on hydrodynamics and climatology of several large lakes in Europe (Ladoga and Onega), North America (Lake Champlain, Lake St. Clair, Lakes Michigan, Erie, Ontario and Huron), and the Baltic Sea. His major scientific interest is climatology and long-term changes of circulation patterns in the Great Lakes. 1992, Ph.D., Physical Limnology / Oceanography, Institute of Limnology, Russian Academy of Sciences, St.Petersburg, Russia. 1982, M.S., Marine Engineering, Russian State Hydrometeorological University, St.Petersburg, Russia. Beletsky, D., R. Beletsky, E.J. Anderson, M.D. Rowe, S.A. Ruberg, T.H. Johengen and C.A. Stow. 2018. Observations and modeling of summer hydrodynamics of Lake Erie in support of coastal hypoxia forecasting. ELLS-IAGLR, Evian, France, Sept. 23-28. Beletsky, R., D. Beletsky, E.S. Rutherford, J.L. Sieracki, J. Bossenbroek, W.L. Chadderton, M. Wittman and D.M. Lodge. 2018. Spread of aquatic invasive species by currents in the Great Lakes. ELLS-IAGLR, Evian, France, Sept. 23-28. Rowe, M.D., E.J. Anderson, S.A. Ruberg, D. Beletsky, H. Zhang, T.H. Johengen, S. Moegling, E.M. Verhamme and C.A. STOW. Coastal upwelling dynamics influence spatial patterns of hypoxia and nearshore hypoxia events in the central basin of Lake Erie (poster). AGU Ocean Sciences Meeting. Portland, Oregon. February 12-16, 2018. Dmitry Beletsky is a Research Scientist at the Cooperative Institute for Great Lakes Research at the University of Michigan. His presentation explores the potential dispersal of Golden mussel (Limnoperna fortunei) larvae in Lake Michigan using a three-dimensional particle transport model.